3103, Hubcap, 16-1/2", 75-90, CHEVY, VAN, 20 PICKUP, 30 PICKUP, SUBURBAN 10, SUBURBAN 20, 18 RIB TYPE, REAR ONLY. 3105, Hubcap used, 16-1/2", 75-87, GMC, 2500 PICKUP, 3500 PICKUP, VAN, SUBURBAN 1500, SUBURBAN 2500, 18 RIB TYPE, FRONT ONLY. 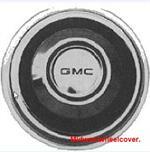 3106, Hubcap used, 16-1/2", 75-87, GMC, 2500 PICKUP, 3500 PICKUP, VAN, SUBURBAN 1500, SUBURBAN 2500, 18 RIB TYPE, REAR ONLY.